Christmas Special - December 16th Through Jan 2nd. vacation villa, for enjoying beach sports such as swimming and fishing. TV and high speed internet access, you will also get magnificent mountain and golf course views from our villa. amenities such as three extremely large swimming pools, (each with swim up aqua bar), their own private beach and beach activities, two on site Deli's, free shuttle service between the resort and sister hotel in town. hotel services directly to the villa. Larry and Darlene Mattson are seasoned travelers that have experienced some of the most exciting locations in the world. Europe, Asia, Russia, Mexico, Hawaii, and of course mainland USA. After all of that traveling, we have come to the conclusion, that Emerald Estates is the "world class" location to make our vacation investment. And now we would like to share it with you. My husband and I and our three children stayed here for two really wonderful weeks. The house is spacious (that's an understatement - the master bathroom is immense!) and very well-equipped. We found everything we needed in the kitchen to cook meals when we wanted to, and having the washer/dryer was a lifesaver with kids on vacation. The beds are comfortable, the house was spotless and there was daily maid service. Having the Pueblo Bonito resort attached to this property is so convenient - we walked over for many meals, we used the pools and had lunch at the pool bars, walked on the beach, used the gym every day, visited the spa, and had drinks at the bar. There are buses on the hour from the resort to their other hotel on the Zona Dorado, which makes getting around very easy. This property is a 15 minute bus or taxi ride from the ZD which we thought was a very good thing. We liked how beautiful and peaceful the property is, a much better choice for us than being in the ZD. The resort was very busy over the holiday season, so it was particularly nice to have our own pool so that when the main pools were packed, we just went "home" very happily. The owner of this property was very helpful and responded quickly whenever we got in touch. We highly recommend this property. And when you go, be sure to visit the beautiful Centro Historico - we had excellent meals at Angelina's Kitchen, El Presidio, and Casa 46. This property is wonderful. 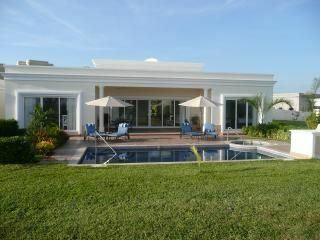 The villa is first rate luxury - spacious, private and comfortable. There is everything you need in the villa and more. We loved our own heated pool, jacuzzi, sunning deck and gardens. The grounds and gardens of Emerald Bay Estates are truly spectacular. The villa is the perfect combination of having your own "private estate" with the convenience and flexibility of first class hotel amenities and all inclusive features (if you choose them.) The restaurants, room service options and staff are fantastic. The service and genuine friendliness of the people is second to none. We highly recommend this property.